Drop cloth - lots of them! Wet/Dry Vaccum This is the extact Wet Dry Vac I have it has a remove control which is handy during a stop start project like and hangs on my garage wall when I'm done. Its one of the best Christmas presents my husband has ever given me. Disclosure: I have included affiliate links for your convenience. Tip: Remove EVERYTHING from the room, including inside the cabinets and cupboards because tile dust is a devious wee beastie and will fly into more nooks, crannies, and cupboards than you can imagine. Removing everything inside your cabinets will save you from even more cleanup after this messy project. 1. If you are in a bathroom, remove the shower door and track if needed. The top of my shower doors lifted straight off the top of the side rails. By carefully removing the shower doors and track, I can reinstall them after I grout the bathroom. I sliced through the line of caulk in between the side rails and the wall with a utility knife. Finally, I unscrewed the side rails and removed them from my shower stall. I'd rather replace the doors than reuse them because they aren't my favorite. Someday when I have more time to devote to shower door shopping, I'll consider new doors but today is not that day. 2. 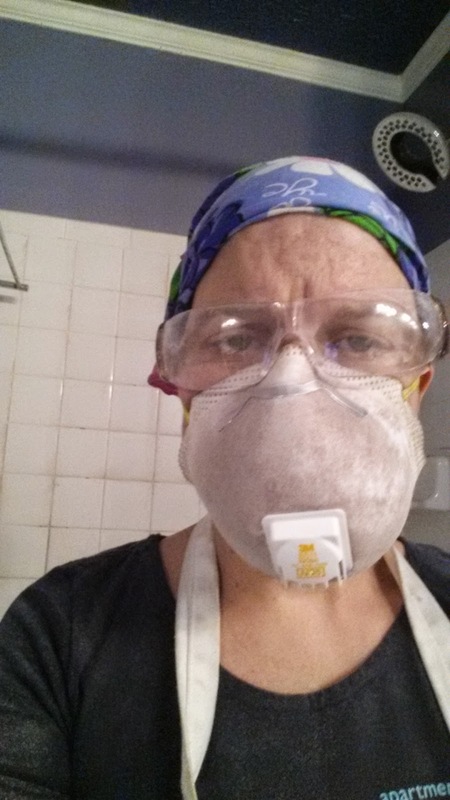 Suit up with safety glasses and a dust mask because you really don’t want grout dust in your eyes and lungs. I kicked it up a notch with my DIY Handy Ma’am apron (learn how I made it here) and a doo rag. It helped but I still had grout dust in places I didn’t realize I had. This is a good time to put the drop cloth over the shower/bathtub drain if you haven’t already. The last thing I wanted was to clog the plumbing with grout dust and new wet grout. I suspect you don’t want to do that either. 3. Remove the caulk from the seams if needed. Slice each side of the caulk line with a utility knife and use the pointy end of the 5 in 1 painter’s tool to remove the caulk. Chances are after you lift up a bit of the caulk with the 5 and 1 tool, you will be able to pull most of the caulk away from the wall with your hands. 4. Remove/unscrew any fixtures (towel bars, organizers, etc.) that are on the to be grouted surface if needed. 5. Remove the grout in between the tiles by placing your tool in a grout line and letting the tool do the work. Use your grout removal tool as directed to remove all of the grout from in between the tiles. I removed all of the grout in my bathroom shower stall. I used the 5 in 1 tool to get the bits my power tool missed. My Dremel is not powerful enough to remove all of the grout from my shower. My local tool lending library doesn’t have the oscillating tool I should have used for this project. I didn’t want to buy a new tool that I would use once on this project. Instead I bought a diamond wheel that fits on a tool I already have. In hindsight, I should have bought an oscillating tool. The grinding wheel worked but it is too easy to accidentally jump out of the grout lines and scratch the shower tile. I scratched the tile. Drat! Removing the old grout lines is the part of the job that is messy and time consuming. Yes, you have to remove all of the grout in between the tile or the new grout will not permanently stick. Trust me. I Goggled at every break I took to find a magic someone to tell me it was OK to leave some of the grout as the job progressed. As messy as it can be, you have to remove all of the old grout before you can add new. Just do it. 6. To remove grout from corners and tight areas, I used a Dremel and a grout removal bit supplemented by the pointy end of my 5 and 1 painter’s tool. Get more information about the Dremel grout removal bit I used here. 7. After you have removed all of the grout, now is a really good time to break out the wet dry vac and clean the unbelievable mountain of grout dust that is covering your work area, the floor, walls, counters, and anything that was foolish enough to stay in that room while you worked. I didn’t want to ruin my vacuum cleaner with big rough chunks of grout. I wisely checked out a wet dry vac from the Columbus Tool Lending Library (free to all homeowners in Franklin County!) I am glad I did. Use unsanded grout if the area in between your grout lines are grout lines smaller than an 1/8 inch wide. 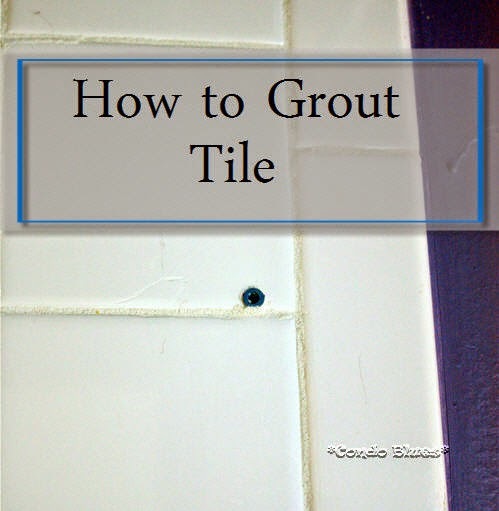 Use sanded grout if the areas in between your grout lines are wider than 1/8 inch. Sanded grout has find sand in it that will keep the grout from shrinking too much in a larger space when it cures. I am using unsanded grout for this project. This grout is too thick. Thin it per the directions on the grout package. The grout in your bucket will harden as you are using it to tile your project. I found it best to mix small batches of grout while I worked instead of one giant batch of grout that would be too hard to use by the time I got to the last wall of my shower. 2. 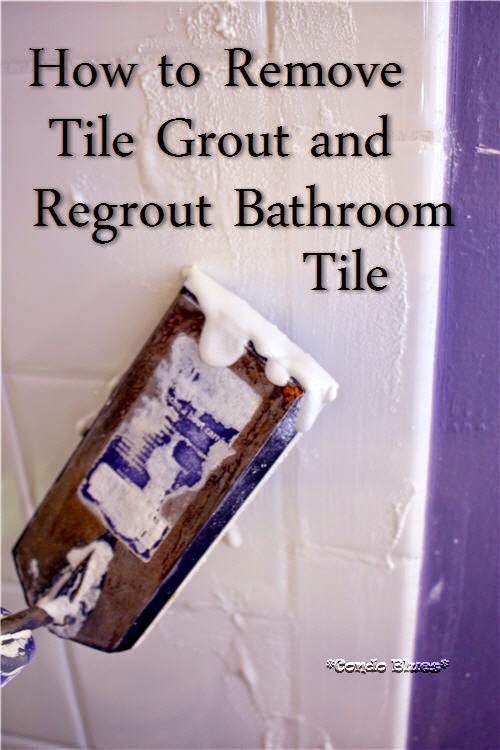 Use a grout float to trowel grout in between a small area of tiles. It is OK if you a little messy with the wet grout in this step. We will take care of that in Step 3. 3. Let the grout set for a few minutes, before removing the excess wet grout from the tile with a sponge and plain water. When your sponge gets too sticky from rinsing it in the water only bucket, rinse the sticky sponge in the vinegar and water bucket to remove the sticky grout residue. Return the sponge to the water only bucket to sponge off excess grout from your tile. I had to do this about a million times during the this step. 4. Optional: To make sure my grout lines were smooth, I ran the pointed end of my 5 and 1 tool along my grout lines to smooth and remove excess grout with out the possibility of accidentally removing too much of the grout with my sponge and water. 5. Allow the grouted tile to cure per the directions on your package of grout. This may (probably) take several days. 6. Reinstall the shower doors and fixtures if needed. 7. After the grout dries reapply caulk to the areas where you removed it. 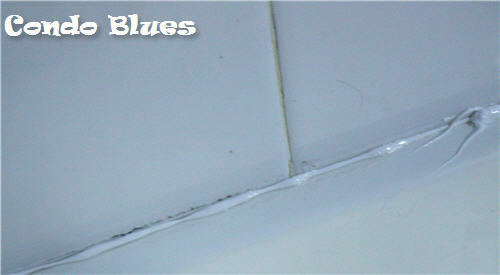 See my tutorial How to Caulk a Bathroom Shower or Tub for details.